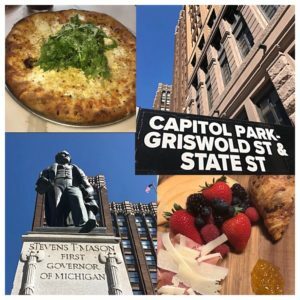 We’ve expanded our popular food tours to Capitol Park! Join us as we stroll and eat our way through this dynamic area of downtown Detroit, rich with history, redevelopment, and excitement. Delish Detroit invites you to explore Capitol Park with us on foot while enjoying a progressive brunch! Capitol Park is the triangular area of downtown Detroit loosely bound by Woodward Avenue, State Street, Washington Boulevard, and Grand River. You will experience the revitalization of this historic part of downtown Detroit firsthand as your guide shares fun facts and stories about the history of Michigan’s first Capitol; the underground railroad; architectural gems; and new housing, retail and street art murals. Along the way, we will pop into some unique places, and visit 4 or 5 new eateries to enjoy specialty eats, which may include egg sandwiches, cheeses, biscuits, brunch pizza, veggies, fruit, noodles, sweets and more – enough food for brunch! Parking: Several convenient parking options are available within minutes of our Dessert Oasis meeting spot. Street parking spots (FREE on Sundays), the 1001 Parking Garage at State & Woodward next to Avalon Cafe & Bakery, the Griswold Parking Garage at Grand River & Griswold next to Urban Bean Co., and the surface parking lot near Cannelle Detroit. We are pleased to be donating $1 from the sale of each Capitol Park tour ticket to Detroit Food Academy!